Sunday afternoon about four o’clock I took a pretty bad crash when the front wheel of my recumbent bike went into the open space under this missing utility box cover on the sidewalk at the intersection of Forest Drive and Two Notch road. I’m pretty sure those dark spots are blood that dripped from my leg as I tried to upright and assess the condition of the bike. Well, there was no permanent damage unless infection sets in, but I had to make a trip to the drug store for some large bandages and to Doctor’s Care for an assessment and a tetanus shot and to the bike dealer for tire repairs. I’m guessing the position of the City of Columbia would be that I am not supposed to be riding the bicycle on a sidewalk. That would be true for a small section of the downtown area where bike riders are being cited if on the sidewalk, but not at this particular location, a busy intersection, blocks from downtown, where no pedestrians were in sight at the time to witness my crash, and where all concerned are safer if bikes stay out of the mainstream traffic. And besides, wouldn’t an innocent pedestrian, perhaps one with an open beer can in a paper bag or with eyes focused on a small screen, be at risk of stepping into such a hole and suffering injury as a result? 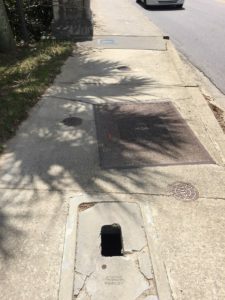 Of course there are hundreds of such utility boxes and manholes on the streets and sidewalks of Columbia, most safely covered, even if not exactly level with the surrounding surfaces. And I think there is some temptation for people to steal these covers and try to sell them as scrap metal. Lot of weight in that cast iron. So, the City can’t be blamed if one goes missing from time to time. Evil abounds! But I took a look around and found another open hole about 50 yards away. Well, this one has even more dark spots surrounding it. Maybe somebody else’s blood! And then I remembered that there is an uncovered one within a hundred yards of my house, at the east end of the Gervais St. Bridge, one that has been uncovered for months. I always notice it, and have grown used to stepping around it I suppose, when I do my monthly trash pickup on Gervais St. between the bridge and Williams St. It is smaller so slightly less hazardous to bike tires and pedestrians. Hmm, only one spot here. Minor accident? Or maybe those spots aren’t blood after all. The end of the bridge is just visible in the background. So, why is this important to anybody other than somebody not paying attention and stepping in or running over one of the holes. It has to do with management, and that is the reason this post is categorized as Management and posted on the Management Page. A city gets no points at all in its ranking as a good place to live for having all such openings carefully covered, level with the surrounding surfaces. That is the expected normal. But a city gets a lot of negative points for such as can be seen in these photos and other preventable hazards such as uneven sidewalks, etc. The question raised has to do with the management system in place by the city to promptly identify and immediately remedy such situations. 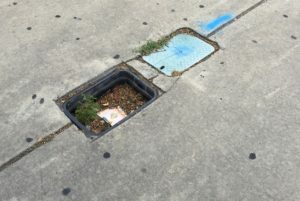 I’m pretty sure that if I sent a note to the Mayor and/or my Councilman about these particular missing covers, they would send somebody out “right away” to remedy them. But that has no lasting value except maybe to assure my vote in the next election in thanks for their responsiveness. What would have lasting value would be a city streets and sidewalks monitoring and repair system that prevented such conditions existing more than the few hours it would take to correct or at least barricade them. I’m not going to try to prescribe that system, but I would be a good exercise for some branch of City Government to undertake at the request of City Council. The whole thing reminds me of when I tripped on a sidewalk discontinuity a couple of years ago just a few hundred yards from home and broke off a front tooth resulting in a $3000 dental bill. 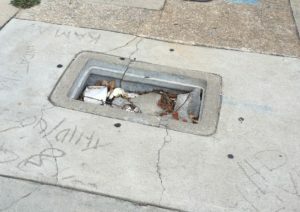 I sent a note to city officials and, within a very short time, that particular spot in the sidewalk had been repaired. But many others like it remain untouched. So, where is the management system? In the meantime, I am going to try to be a lot more careful as my clumsiness increases with age.